La Mer is a song that Constant Abeels sings when he is walking in the rain to his house 1) The same song is played when Abeels in working in his shop in Brüsel 2). The lyrics are the same as a song in the lighted world with the same name by Charles Trenet. 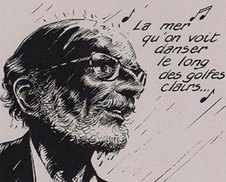 His song “La Mer”, which according to legend he composed with Léo Chauliac on a train in 1943, was recorded in 1946. Trenet explained in an interview that he was told that “La Mer” was not swing enough to be a hit, and for this reason it sat in a drawer for three years before being recorded. “La Mer” is Trenet's best-known work outside the French-speaking world, with more than 400 recorded versions. The song was given unrelated English words and under the title “Beyond the Sea” (or sometimes “Sailing”), was a hit for Bobby Darin in the early 1960s, and George Benson in the mid-1980s. “Beyond the Sea” was used in the ending credits of Finding Nemo 3).